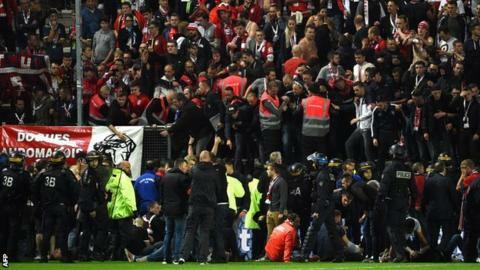 Five fans were seriously injured when a barrier collapsed at the front of a stand during a French top-flight match. At least 29 people were hurt in the incident, which occurred in the 16th minute of Amiens' Ligue 1 match with Lille at the Stade de la Licorne. A barrier in front of the away section buckled as fans celebrated Fode Ballo-Toure's goal, and dozens fell about one and a half metres onto the pitch. The match was abandoned and the stadium evacuated after a security meeting. The local prosecutor said he had opened an investigation into the incident. An update from Lille's official Twitter account on Sunday said: "Six people are still hospitalised this Sunday morning, but the news is reassuring. Come back to us soon in good health." Amiens v Lille is seen a derby, with about 98km (61 miles) separating the two sides. Amiens are competing in the French top flight for the first time in their 116-year history. Their 12,000-capacity Stade de la Licorne is the smallest of the 20 Ligue 1 clubs.